Andrew Lemoncello (born 12/10/1982) has been perhaps the most successful Scottish male distance athlete of the last decade, although his career has recently been hampered by injury. Andrew was born in Tokyo, Japan, on the twelfth of October 1982. His father is American and his mother Scottish – (Phyllis Lemoncello has won several Scottish Masters CC titles.) Andrew grew up in St Andrews and attended Madras College – he still holds all the School distance running records. He joined Fife AC and was coached for several years by Ron Morrison. An early success was coming second in the Scottish under-13 high jump! However he also won the Scottish road and cross-country titles at that level (1996) and also under-15 (1998). After a couple of years finishing on the podium but not in first place (although his Fife AC team won gold in 2000), he regained the top spot by winning the Scottish Junior National CC in both 2002 (when Fife won as well) and 2003. In addition he had started running the steeplechase, winning the Scottish 2000m title in the appropriate year – 2000. He won the Senior Scottish 3000m steeplechase in 2000 and 2002 and was second in the AAA under-23 event in 2003, improving his personal best to 8.47.32. That year he ran for the GB under-23 team against Catalonia and Italy. He studied at Stirling University and won the 2004 British Universities Championships for 5000m and 10,000m. Back in 2001 Andrew had been part of the GB Junior team which won gold at the European CC Championship. Then he came eighth in the World Mountain Running Trophy Junior Men’s race. 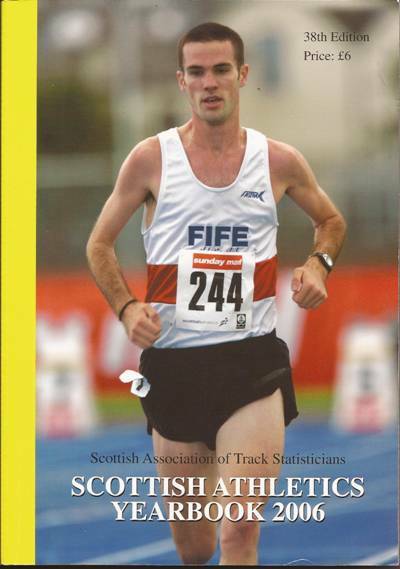 A very good cross-country result for Andrew was in the 2004 Senior National, when he came third and Fife AC were third team. He also won the Scottish CC title over 4k. Andrew Lemoncello was offered a scholarship to Florida State University in Tallahassee, which let him train and race regularly with top athletes. In an article in the 2006 Scottish Athletics Yearbook, Andrew described his new regime. “All the facilities, including the track, are within a ten to fifteen minute walk of my house, and there are great trails just a short drive away. The climate is perfect – it is about 80 degrees all year round, apart from a couple of weeks when it dips to 60.” However it wasn’t exactly a pampered existence. He had to get up at 6 a.m. each morning for the first of two daily runs, separated by ice baths and lunchtime naps. “We train hard and then rest so we can train harder the next day.” Every week he logged around 100 miles, consisting of a variety of sessions, including steady and tempo runs, speed drills, lactate threshold runs, long and recovery runs. Add in two weights sessions per week, and – of course – classes for his B.A. in Sports Management, and it was a tired Scot who climbed into bed most evenings. 2005 was a busy and successful year. After a hectic Spring season in America, producing a number of track bests, in July Andrew triumphed at the AAA Championships, winning the steeplechase in 8.33.93. Subsequently he was selected for the Great Britain team for the Helsinki World Championships. As part of his build-up he won the Scottish 5000m title; but unfortunately did not get past the heats in Finland. 2006 allowed him to produce consistently good times on the track in America and also to retain his Scottish 5000m championship. Sadly he chose to withdraw from the Scottish team for the Commonwealth Games, due to university commitments in the USA, and also did not run in the European Championships. 2008 was Olympic year. In March, having been fourth in the Inter-Counties CC selection race, Andrew Lemoncello ran for Britain in the World CC Championships in Edinburgh. He finished third in the European Cup steeplechase once again, and shortly afterwards came third in the AAA Olympic Trials. At the last moment he qualified for the GB team by running an outstanding new best of 8.22.95 on the 18th of July in the Paris Golden League. However he did not qualify from his heat in Beijing, despite running a decent time of 8.36.06. In retrospect, he believes he peaked too early. Then he came back to Scotland and, for the fourth year in succession, won the Scottish 5000m title, this time defeating the two Shettleston Eritreans. After a hard winter grinding out the miles, Andrew Lemoncello was ready to make his debut in the 2010 London Marathon, and although he had hoped to go a little faster, was quite happy about his eighth place (first Briton) and time of 2.13.40. When he continued to show fitness by being first man in for the UK at the Great North Run Half Marathon in September 2010, and had a number of good runs in 2011, all seemed well for London 2012. Sadly, Andrew Lemoncello tore a hamstring before he had a very bad time in the Fukuoka Marathon in December 2011 and did not have time to prepare for the Olympic Selection race at London (in April 2012). He did finish fifteenth (and second Brit in 2.15.24) but the time was too slow for the team and anyway, his injury problems persisted. When interviewed later for the Saint Andrean, Andrew Lemoncello said that his favourite training runs were the Mesa Trail in Boulder, Colorado, and along the Old Course and then back via the West Sands in St Andrews. His current ambition was to get healthy and be able to run pain free once more. Looking ahead, he wanted to run another fast marathon, perhaps at the 2013 London event, and in 2014 to be in a good position to win a medal at the Glasgow Commonwealth Games. He still had many sporting ambitions. Andrew’s sporting hero was Liz McColgan and his drink of choice a good craft beer. This brief profile of Andrew Lemoncello is written just before his thirtieth birthday – he is definitely still young for a marathon man! Any Scottish runner will admire his many outstanding athletic achievements and hope fervently that he will avoid further injury and succeed in fulfilling all his ambitions. Personal Bests: 1500m – 3.45.6; 1 mile – 4.03.22; 3000m – 8.00.9; 5000m – 13.33.01; 10,000m – 27.57.23; 3000m steeplechase – 8.22.95; 10 miles road – 47.41; half marathon – 63.00; marathon – 2.13.40. That was where Colin finished his profile although Andrew is still relatively young and it will have to be updated as his career progresses.